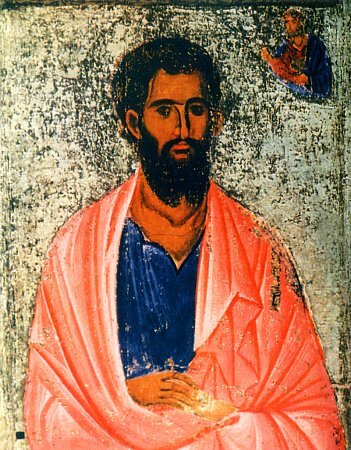 The Holy Apostle James, Brother of the Lord, was the eldest son of Joseph the Betrothed from his first marriage with Solomonia. The Apostle James is remembered in the holy days after the feast of the Nativity of Christ together with his father Joseph and the Prophet King David, since by tradition, he accompanied the Holy Family during the Flight into Egypt and dwelt there together with the God-Infant Jesus, the Mother of God and Joseph, helping them, and he returned with them to Israel. After the Ascension of the Lord, Saint James was the first bishop of Jerusalem, gaining the great esteem not only of Christians, but also among Jews. He accepted a martyr's death for Christ: they threw him off from the roof of the Jerusalem Temple since he had publicly preached to the people about the God-manhood of the Lord Jesus Christ (a 2nd Commemoration of the Apostle James is 23 October).